A very interesting street scene showing Quorn Cross in about 1930. Whilst the quality of the photograph is not as sharp as some, scanning it at a high resolution and zooming in reveals some fascinating detail. The Royal Oak pub can be seen on the left, and the sign indicates that the landlord is C A Prince. 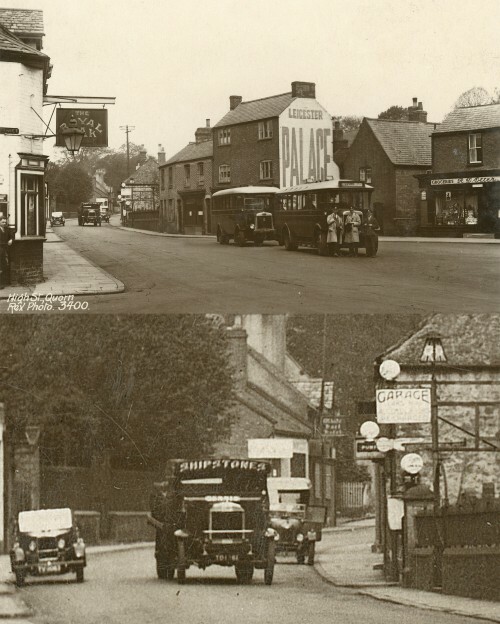 A Shipstones beer lorry is in the centre of the road, and it is just passing on the right, a building next to the old Methodist Church, displaying a large sign saying ‘Garage’, and it has at least one petrol pump. This row of properties has since been demolished. See enlargement below main picture. On the far right is R D Otters, which was the Post Office and a general store. Robert Drury Otter ran the shop from the early 1920s until shortly before his death in 1945. An enamel sign attached to the wall on the left of their window says “Agents for Pullars Dye Works, Perth”. Pullars were the first dry cleaners in Britain and Otters were one of their many thousands of agents. The front bus is registration number UT 37, a Leyland Lion with Leyland 31 seat body. This was new to C H Allen, Mountsorrel, fleet number 6, in January 1927, working on the Loughborough to Leicester via Woodhouse service. The two men in long dust jackets are the Allen's crew. Behind this is Kemp & Shaw, Leicester, registration UT 1946, also a Leyland Lion with 28 seat body, possibly made by Willowbrook. It was new to Mason of Anstey in November 1927, passed to C H Allen in March 1929 and on to Kemp & Shaw in September 1929, fleet number 11. It is working the Loughborough to Leicester via Rothley service. The man on the right of three crew is the Kemp & Shaw conductor.